2013 – Airport Master Plan unveiled, itemising development proposals up to 2030. 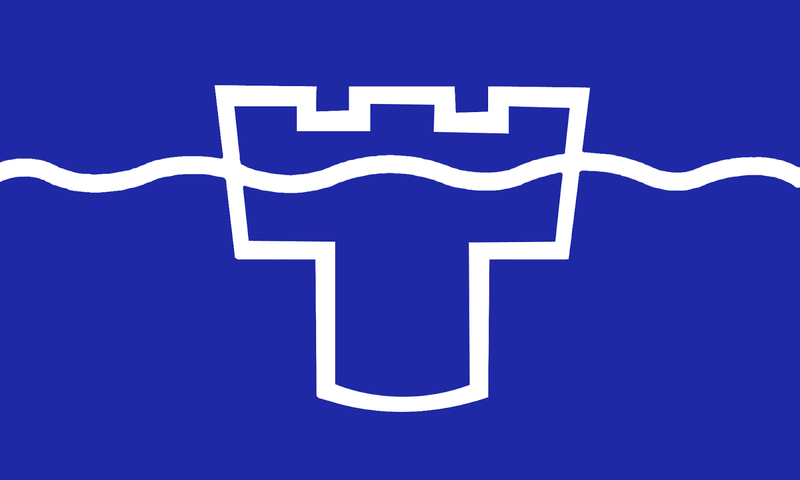 Just in case you don’t recognise it, this is the flag of Tyne & Wear – the much maligned new ‘county’ formed as a result of the controversial reshuffling of the shire borders of England in 1974. As a consequence of legislation passed since, it has both ceased to exist in one sense, yet continues to exist in another. It has left us locals all rather confused. Formerly, the mini-county was shared between Northumberland to the north and County Durham to the south, with the boundary being provided by the River Tyne. After years of humming and hawing, the powers-that-be decided to carve up the land thereabouts as illustrated above. ‘Tyne & Wear’ was the name given to the new creation (born, ironically, on 1st April 1974), it being officially known as a ‘metropolitan county’. The venture was seen as a way of giving the largely urban population of the area a more efficient and properly focussed way of governing their patch of the UK, independent of the old historical counties which continued to exist in reduced form. The Tyne & Wear brand proved difficult to sell to a resident population that was, remember, traditionally split between Northumberland and Durham and (more importantly) between Geordie and Mackem. It had its own county council, of course, and it can be argued that much good was done in its name; but after limping on for a decade or so the council was abolished in 1986, with the five ‘metropolitan authorities’ of Newcastle, Sunderland, Gateshead, North Tyneside and South Tyneside going their separate ways, essentially becoming self-governing. Rather than reverting back to a clean Northumberland/Durham split, though, it was decided to maintain the ‘Tyne & Wear’ brand in a somewhat half-cocked way. Many services continued to be run jointly by the five authorites (transport, fire & rescue, museums & archives, etc. ), and the ‘Tyne & Wear metropolitan county’ continued (and continues) to exist in law and as a ‘geographical frame of reference’. It also still exists as a ‘ceremonial county’, which means that it has a Lord Lieutenant acting as a representative of the monarch. 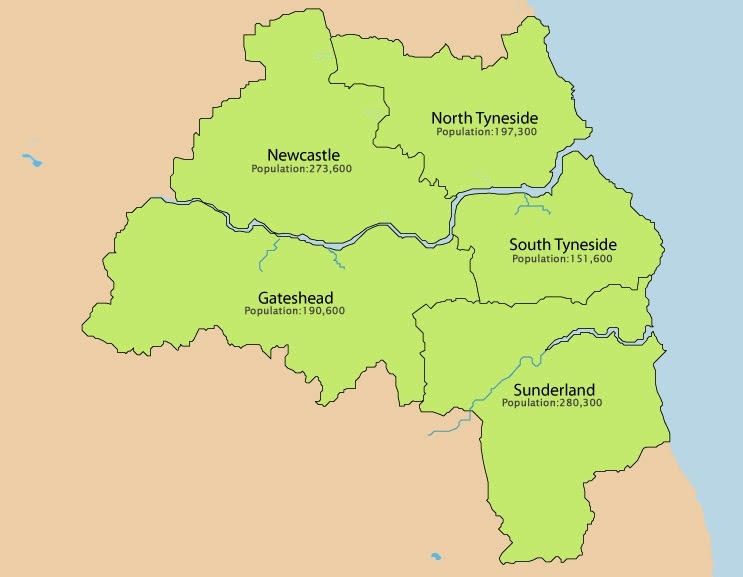 There is, however, no longer any Tyne & Wear-wide administrative/governmental body. It seems only a matter of time before the term ‘Tyne & Wear’ disappears into history – there being quite a clamour, generally, for a return to the historic county boundaries across the whole of England. Royal Mail officially doesn’t care whether we use Northumberland, Co.Durham, Tyne & Wear or, indeed, nothing at all for the county line of addresses on our envelopes. For the moment, though, we stagger on somewhat confusedly – and under the banner of our proud blue flag, if you feel so inclined. 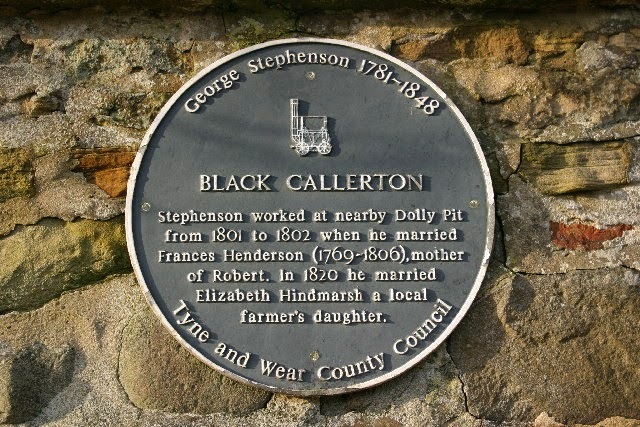 The tiny hamlet of Black Callerton between Newcastle and Darras Hall holds a rather important place in the personal history of perhaps the greatest ever north-easterner, George Stephenson. Not only does it feature in the earliest years of the man’s illustrious career, but it also had quite a say in his family life, too. The famous engineer and ‘Father of the Railways’ was born in 1781 at Wylam, a few miles to the south-west of Black Callerton. Illiterate until the age of eighteen, the self-taught genius first worked at Newburn colliery, before becoming a brakesman at Black Callerton (which involved controlling the pit’s winding gear) in 1801. Rumour has it that whilst there he secretly courted a local farmer’s daughter called Betty Hindmarsh, whom he would meet in her orchard – and behind her parents’ back. All attempts to woo her failed, though – the girl’s father having none of it on account of our man’s lowly status. He thereafter made approaches to another local lass, Anne Henderson, before moving onto her sister, Fanny, who quickly became his wife. In 1802, the couple moved to Willington Quay, east of Newcastle. Fanny died in 1806, leaving George with one surviving child, the famous Robert, born 1803. Whilst George built his career, young Robert was raised by a succession of neighbours and relatives. Eventually, though, George would marry again, and, strangely, the Black Callerton link would return to shape his life – for it was into the arms of his first love, Betty Hindmarsh, that the now hugely successful (and very wealthy) George would fall. They married (at Newburn) in 1820. The marriage appears to have been a happy one, though they had no children. Betty took great care of her step-son, Robert, before her death in 1845. George still found time to marry for a third time shortly before his own death in 1848, but was buried alongside ‘Black Callerton Betty’ in Chesterfield. Wingrove – No one seems too sure about this one, but it may be OE in origin, meaning ‘the grove (group of trees) of wiga’s followers’ (or someone similar).